Performing as a member of the Camerata Chamber Choir provided excellent opportunities of in-depth exploration of the composition and orchestration techniques employed by some of the great composers of choral music. 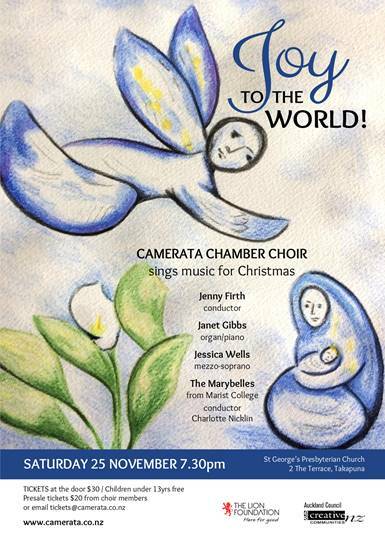 The program included Cecilia Mcdowell's "Christus Natus Est" (2002) featuring soloist Mezzo-soprano Jessica Wells and Marist College children’s choir "The Marybelles" with conductor Charlotte Nicklin. Traditional favourites included works by Benjamin Britten (A Hymn to the Virgin, There is no Rose), the Basque carol Gabriel’s Message, the very traditional and haunting Veni, Veni, Emmanuel, John Rutter pieces "Jesus Child" and "Mary’s Lullaby" plus the Irving Berlin classic "White Christmas" and Martin and Blane’s "Have yourself a Merry Little Christmas". Jenny Firth, Camerata Chamber Choir, choral, Christmas music, Cecilia McDowell, Marist College children’s choir "The Marybelles" with conductor Charlotte Neckline, Benjamin Britten, John Rutter, Irving Berlin, Martin and Blane.